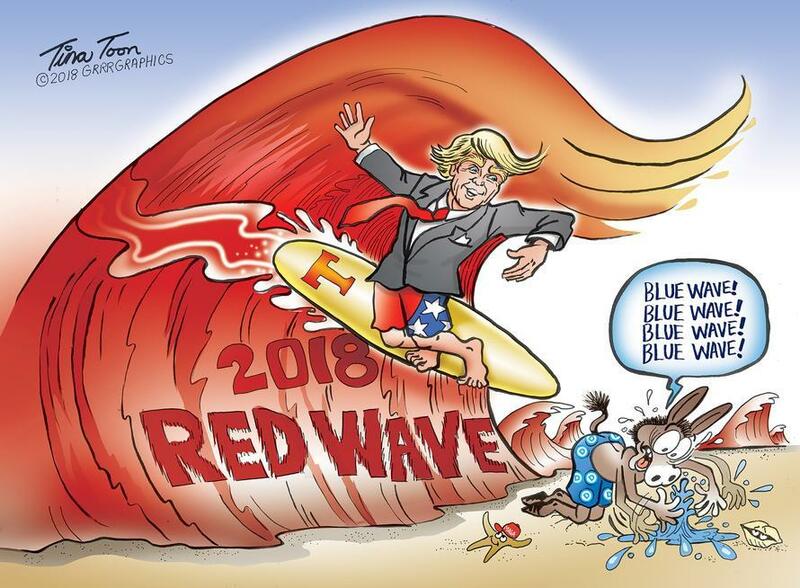 "Is the blue wave turning purple?" While this statement might not seem like much of a concession from left-leaning NBC News, a more thoughtful analysis reveals that it's just the latest indication of a shifting political reality - one that anti-Trump news organizations can no longer afford to ignore: That, just like in 2016, Republican turnout in the upcoming Nov. 6 midterm vote is already looking to be much higher than the polls initially predicted as issues like the migrant caravan and the contentious confirmation of Supreme Court Justice Brett Kavanaugh have backfired on Democrats (who had hoped they would sway moderates to vote against Republicans) and instead galvanized the conservative movement and alienated those very same moderates they had hoped to attract. According to the latest polling data, Republican-affiliated voters are outpacing Democratic-affiliated voters in early voting in seven closely watched battleground states. This according to data from TargetSmart, which was analyzed by NBC's Data Lab. Democratic candidates have already fallen behind in Arizona, Florida, Georgia, Indiana, Montana, Tennessee and Texas. The only battleground state where early voting Democrats outnumbered their Republican peers was Nevada. While early votes represent only a small fraction of the total, these data appear to confirm that the surge in interest among Republican voters reported by the Wall Street Journal last week has already translated into higher turnout at the ballot box. Key Senate races that could determine whether Republicans retain control of the Senate are underway in seven of the above-mentioned states. In Arizona, Republican-affiliated early voters outnumbered Democrat-affiliated voters by more than 10 percentage points. In Arizona - where two members of the House, Democrat Kyrsten Sinema and Republican Martha McSally, are in a neck-and-neck contest to fill retiring Republican Jeff Flake's Senate seat - 44 percent of early voters had a Republican affiliation, compared to 33 percent who had a Democratic affiliation. Twenty-three percent of early voters were not affiliated with either major party, and thus grouped as "other" in NBC News' partisan analysis. And in Texas, Republicans are already turning out to support Ted Cruz over upstart Democratic challenger Beto O'Rourke. Further confounding the Democratic "blue wave" narrative, women outnumber men in early voting in nearly all of the states seeing a surge of Republican turnout. Already, more than 5 million votes have been cast in the midterm elections. While Democrats will probably rationalize this turnout by telling themselves that "conservatives vote early", with polls showing Republicans closing the gap with Democrats, this pattern is looking eerily familiar.